Cochrane comes to Hyderabad, India in September 2014: How can we best use this opportunity to influence the trajectory of health care in the region and globally? With less than a week to go before the close of early registration (July 31st, 2014) and the beginning of regular registration (till September 1st, 2014), we are busy putting the finishing touches in our preparations to host the largest and most important business and scientific meeting that the world will see this year of people and organizations involved in producing, maintaining and disseminating credible evidence to inform health decisions. This gathering has the potential to affect the lives of millions of people living in the region and globally. 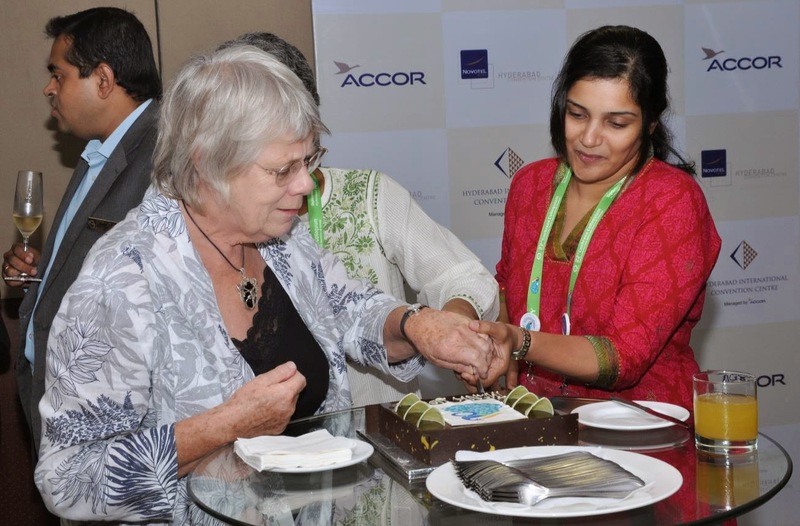 The CochraneCollaboration will celebrate its 21st Anniversary as the world leader in providing credible evidence to inform health decisions at the 22nd Cochrane Colloquium that will be held at the Hyderabad International Convention Centre (HICC) from the 21st to 26th September, 2014. Pre-Colloquium workshops and symposia will be held on the 20th and 21st and post-Colloquium workshops on the 27th and 28th September at the HICC and other venues in Hyderabad City. The theme of the Colloquium, 'Evidence-Informed Public Health: Opportunities and Challenges' provides participants of the Colloquium a platform to discuss ways in which Cochrane evidence, and Cochrane methods that have evolved, and been refined, over the past two decades, can contribute to improving public health globally and regionally; given the context-specific challenges faced by health systems and organizations involved in delivering public health and developing public health policies, particularly in resource-constrained settings. Why is this Colloquium particularly important to health decision-making in the region and globally? The Hyderabad Cochrane Colloquium marks the first time that a Cochrane Colloquium is being held in South Asia. Cochrane Colloquia differ from the usual scientific medical conferences that are held in the region. These medical conferences usually involve people from single disciplines, such as renal medicine or diabetes, and focus on recent advances within these disciplines. Though undoubtedly of value to those within these disciplines, they differ from the scope of Cochrane Colloquia that are of relevance to a wide range of people from different disciplines involved in ensuring that the evidence for the effects of health-interventions across disciplines, or of the accuracy of diagnostic tests or procedures used in all areas of health care, are underpinned by robust methods, and hence can be trusted to provide benefits of relevance to those using them. Driven by collaborative efforts involving some of the best methods experts and researchers working in different areas of healthcare, the scientific sessions at the Hyderabad Colloquium will help equip participants with the knowledge and skills to evaluate whether the recent advances and established interventions in their disciplines are actually worth investing in, and the extent to which they will deliver the benefits reported in primary research studies. The scientific sessions and skills-building workshops at the Colloquium will include topics relevant to research design, locating evidence, research synthesis, dissemination of research evidence, and using research evidence to frame policy options. They will involve clinicians from medical, surgical, nursing, dental and allied health fields; clinical and laboratory researchers; health administrators; health policy makers; health economists; statisticians; public-health specialists; health-related national, regional and international organizations; health technology experts; the media, information and communication specialists; health care consumers, their care givers, and their advocates; and members of the lay public interested in health issues. All this will occur without any funding from the drug or device industry, and hence ensure that Cochrane evidence is not influenced by those with a vested interest in the interventions or diagnostic tests being evaluated. The Hyderabad Colloquium will therefore provide considerable opportunities to influence the trajectory of health care and health decisions in the South Asian and wider Asian region by providing an alternative ‘evidence-informed’ model to the pre-dominant ‘profit-based’ or ‘opinion-based’ models of health care prevalent in many parts of the region. Such a gathering of people and organizations committed to using the best-available evidence to inform health decisions and health policy has the potential to inspire people in the region, particularly younger health professionals, who are dissatisfied with current models of health care and health decision-making, or who are unsure about how to make any changes to existing systems, or who are at that stage in their professional careers where local and global partnerships with individuals and organizations involved in these endeavours can influence the direction of their professional lives. Building such epistemic communities, with their own spheres of influence on health decisions, has an immense potential to influence how people in the region view evidence and the role that reliable and relevant evidence can play in improving health outcomes. This is undoubtedly one of the important benefits we expect from holding this Colloquium at Hyderabad. The greater participation of people from the region at the Hyderabad Colloquium will also provide Cochrane with unique opportunities to learn from participants about the contextual issues that impact on evidence-informed health decisions, particularly those affecting public health. This region is home to a large part of the world’s population, and is marked by considerable diversity in access to, and the delivery of health care. Innovative ways of dealing with such diversities can also help inform health decisions elsewhere. This will provide Cochrane with opportunities and challenges as it builds on the success of its global endeavour over the past two decades and plans for the future. What can a newcomer expect from attending this Colloquium? Anyone who attends a Cochrane Colloquium can be assured about one thing. You will never be same again. Cochrane Colloquia provide opportunities to meet with and be inspired by some of the world’s leading experts in research synthesis and in promoting the dissemination and uptake of research; and you will see health decision-making in an entirely new light. The interactions and the opportunities for collaboration offered by attending a Cochrane Colloquium are unparalleled. You can attend pre-Colloquium and post-Colloquium sessions focussed on using health technology more effectively in producing and disseminating research evidence, learn about critical appraisal and peer-review, hear about the work of Evidence-Aid that was an outcome of a massive regional disaster-the Asian tsunami of 2004, and that now provides an platform to provide relevant evidence to those involved in humanitarian relief after disasters; get involved in an exciting partnership between Cochrane and Wikipedia; learn about the methods of research synthesis in public health, and attend a two-day primer on health economics. There are also full day workshops on the methods of research synthesis of diagnostic test accuracy and on grading the evidence. Many of these are free for those registered for the full Colloquium. During the Colloquium, we will have five themed plenary sessions with three to five plenary speakers per plenary who represent a range of experiences and expertise from around the region and the world; and a special plenary dedicated to the 2nd AnnualCochrane Lecture that will be delivered by Professor Gordon Guyatt from McMaster University, Canada, who coined the term Evidence-Based Medicine. Oral presentations (around 80+) will be held concurrently in the forenoon, after the plenary sessions. There will also be six themed specialsessions during the forenoon, concurrent with oral sessions. Over 80 skills-building or information-sharing workshops will be held concurrently in the afternoons. Over 200 attended poster sessions will be held during the morning breaks and over lunch. Meetings of Cochrane Groups will be held before and after the scientific sessions and during breaks. The topics covered in these various scientific sessions and workshops provide an eclectic mix of topics traditionally covered in Cochrane Colloquia as well as newer topics that address the challenges Cochrane faces in making review production more efficient, and the products more accessible to, and in formats required by those who need this evidence. There will also be sessions devoted to improving the evidence-base in complementary and alternative medicines including Ayurveda. We will also have a special session for newcomers to Cochrane and to Cochrane Colloquia to welcome you and connect you to relevant people with whom you can partner with in the years to come. 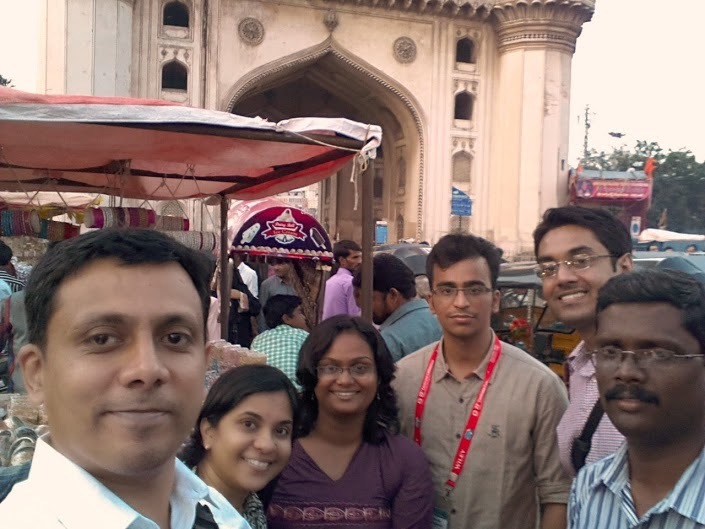 What does Hyderabad have to offer participants at the Colloquium? Apart from the scientific content at the Colloquium, Hyderabad is an ancient city that offers visitors the best of modern conveniences as well as glimpses of its 400-year old past. Visitors to Hyderabad can be assured of a well-connected city, comfortable and safe accommodation, delectable local and international cuisine, a temperate climate, a dazzling array of shopping options, a welcoming population and enduring friendships. Hyderabad is an ideal destination for first-time visitors to India, and a great launching pad to visit other destinations in India and the region. Participants registered for the Colloquium will be offered free tours of some of the iconic places in the city, as well as optional customized tours that will give you a specialexperience of the city and its culture. The glittering welcome reception will feature exceptionally talented artistes bringing you the best of the drums and dances of India and we also offer you the opportunity to become a Bollywood star in our Cochrane-BollywoodDance-off that will be highlight of the BollywoodNight-Gala Dinner. We will be happy to help you with any enquires and to facilitate your travel; e-mail us at: colloquium@cochrane.org. Participating in the 2014 Cochrane Colloquium at Hyderabad as a delegate, exhibitor,or sponsor offers you opportunities far in excess of that offered by attending scientific conference. You will be participating in history as Cochrane celebrates the generosity of its contributors and all those who have worked collaboratively over the past 20 years to improve the health of millions of people world-wide through the use of credible evidence; and as Cochrane prepares to face even more challenges at Hyderabad in September in understanding the challenges of providing evidence to improve public health, particularly in under-resourced settings, and in attempting to seize the opportunities offered by collaboration in influencing health globally and regionally. Can you think of anything better to do this year? Swagatham! We look forward to welcoming you to Hyderabad. The national provision for country-wide access to The Cochrane Library in India has just been renewed for a further three years. This will provide millions of people in India continued free access to the best available evidence on the effects of healthcare interventions. The Indian Council of Medical Research (ICMR) released the first installment of funding for a three-year national license on April 30th, and the period of the license will begin from when the previous subscription ended in December 2012. People in India continued to enjoy one-click free access from January to April 2013 due to the largesse of the publishers, who ensured continuity in the availability of this valuable resource, since the ICMR had indicated willingness to continue this subscription. People in India have now had uninterrupted access to the full contents of The Cochrane Library since 2007, except for a brief period in 2010, when access was halted for nearly a month due to delays in renewal of the national license. Usage took a full six-month period to build up to what it was before free access was stopped. Fortunately, freedom to access reliable evidence to inform health decisions did not stop at midnight on March 31, 2013, as I had earlier feared would happen. The South Asian Cochrane Network and Centre thank the ICMR and Wiley-Blackwell for working together to ensure that all people in India, with access to an internet connection, will continue to have instant access to the resources provided by The Cochrane Collaboration to ensure that all health decisions may be informed by reliable evidence about what works, what does not work, what may harm, and what interventions require further evidence to support their wide-spread use. I am also personally grateful to the numerous people world-wide who wrote, or called in, to express their support for this initiative; to the many journalists who carried our concerns about a potential lapse in the renewal of the national provision to people in different parts of the world; and to the group of medical students in India who started an on-line petition to support the ICMR-funded national provision. Thank you. National free access to reliable evidence is a privilege afforded to people in a region or country, where someone else has made this access possible. This privilege has limited value if the evidence is not used. Millions of Indians, including health professionals, are still unaware of the availability of this resource, or of how to access it, or how to interpret the evidence in The Cochrane Library. It behooves those of us who have enjoyed the fruits of this privilege to ensure that others in need of evidence to guide decisions about their health, or the health of others, who are unaware of this reliable source of evidence, also benefit from this opportunity made available by this prudent investment by the ICMR. For instance, evidence from two Cochrane Review on the effects of long-term hormone replacement therapy in peri-menopausal and postmenopausal women and on hormone therapy for preventing cardiovascular disease in post-menopausal women found no evidence that HT provided any protective effects against the development of heart disease, either in healthy women or women with pre-existing heart disease. On the contrary, both single (oestrogen alone) and combination HT (oestrogen plus progestogen) given to relatively healthy post-menopausal women significantly increased the risk of stroke and venous blood clots, and gall bladder disease; while combination HT, additionally, significantly increased the risk of a heart attack or blood clots in the lungs (pulmonary embolism), fatal or nonfatal heart attacks after one year's use, stroke after three years' use, breast cancer, gallbladder disease, death from lung cancer; and dementia in women over 65 years. Among women with existing heart disease, combination HT significantly increased the risk of blood clots in the leg veins and in the lungs. However, even today, many post-menopausal women in India continue to be prescribed long-term HT by their physicians in the misguided belief that this may be beneficial. I urge the Federation of Obstetrics and Gynaecologists in India (FOGSI) to work with their members, and the Drug Controller General of India (DCGI), to ensure that appropriate steps are taken to ensure that long term HT is not prescribed in this country to unsuspecting women, since the dangers of its use surely merit immediate preventive action at a national level. 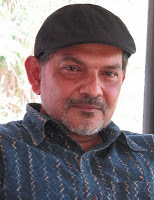 Numerous examples exist where Cochrane evidence indicates that health interventions that are harmful or of little benefit are continuing to be used in India, while interventions of little or uncertain benefit are prescribed, and others that are likely to be beneficial are not used enough, or not at all; some of these instances are due to best practice being sacrificed at the altar of profit-based medicine, while others are due to sheer ignorance of the existence of this evidence. Last year saw the inauguration of the The International Society for Evidence-Based Health Care (ISEHC), as well as the Indian Chapter of the ISEHC. We also now have an Indian Satellite of the Cochrane Public Health Review Group. Numerous Cochrane Reviews of importance to public health in India exist that require dissemination; and the free national access to The Cochrane Library is an opportunity to ensure that the investment of the ICMR in providing access to reliable evidence is utilized by these bodies and their members, in order to improve health outcomes for the people of India. Reliable evidence indicates that about half of all clinical trials that have been conducted have never been published, and trials with negative results about a treatment are more likely to be not reported or selectively reported, so that adverse outcomes, and outcomes that did not favour the investigators’ experimental drug, are never revealed, to the detriment of people’s health. While the methods of the Cochrane Collaboration are robust and can identify trials with outcomes at high risk of bias, sometimes researchers and drug companies refuse to divulge data even when requested. To ensure that Cochrane Evidence is based on all relevant data from included studies, and not only what researchers wish for others to know, is a difficult task that requires an international commitment to transparency in research as being more important than the whims of researchers or their masters. A global campaign was launched to combat selective reporting and publication of the results of trials. The All Trials Campaign seeks world-wide support to ensure that all trials are registered and their results reported in full. The Clinical Trials Registry-India (CTRI) has had some success in ensuring that trials in India are prospectively registered before recruitment of the first participant; but this is enforced only for industry funded trials due to a directive from the DCGI. Prospective registration not only helps prevent selective and distorted reporting of trial results but can also improve their design and conduct, since the template for registration in the CTRI facilitates the disclosure of methods that improve scientific validity, and ethical conduct of trials. However, India has no mechanism in place or on the anvil, to ensure that all trials are published in full, or for access to data from these trials, should the need arise. India can support this world-wide effort in a number of ways. You can individually sign the on-line petition. The ICMR can pledge support to this initiative and join other international organizations and agencies, and even national research councils, such as the South African Medical Research Council, and student organization, such as the American Medical Student Association, in committing to this initiative. Ethics committees of universities, medical colleges, and clinical establishments that undertake researchers can also sign the petition and ensure that the goals of this campaign are fulfilled in their institutions. Medical journal editors can serve as effective gate-keepers by ensuring that all trials that they publish are prospectively registered, and that manuscripts of trials submitted for publication provide access to full trial results, including raw data, if required. The Indian Council of Medical Research (ICMR) created history in February 2007 when India became the first and only low-income country in the world with a national subscription to The Cochrane Library. This initiative of the ICMR to purchase a national license was widely hailed as an exemplar of responsible leadership in health-research governance, as it gave all people in India with an internet connection free access to the online collection of reliable evidence-based resources to aid health decisions. Easy access to trust-worthy summaries that synthesize all relevant evidence, and that is not influenced by the marketing manipulations of drug companies, is the key step in evidence-informed health care; as it facilitates the working together of public and private health providers and their patients to better understand treatment options. The increased use of the resources in The Cochrane Library over the three years of the national provision led to the ICMR renewing the subscription for India-wide free access for a further three years to January 2013. This renewal created history again, since India became the first middle-income country in the world with a national provision; having moved in the interim from being a low-to a middle-income country. The current national provision expired on 31 January 2013, and is up for renewal. Unless the national license is renewed, before the two-month extension granted by the publishers also expires, people in India will have free access to The Cochrane Library only till midnight on March 31, 2013. Why should India renew the national license to free, one-click access to The Cochrane Library? The Cochrane Library is a collection of six databases that is the world’s single best source of reliable and timely evidence for the effects of interventions used in healthcare, and of the accuracy of tests used to diagnose health problems. One of these is the Cochrane Database of Systematic Reviews (CDSR) that is produced, updated, and disseminated by The Cochrane Collaboration. This global organisation, founded in 1993 and registered as a charity, is a partnership of more than 30,000 active contributors, nearly 25,000 of who are authors of Cochrane Reviews. Many are world leaders in their disciplines and work in reputed academic institutions and organizations in over 100 countries. These researchers work with editorial teams (Collaborative Review Groups) to produce high-quality summaries of the evidence in the form of systematic reviews. Systematic reviews are scientific studies that follow transparent and pre-stated methods to identify all relevant research studies on a specific topic; assess them for limitations in their methods that could result in misleading results; and, if appropriate, combine the results of similar studies using statistical techniques called meta-analyses that provides averaged estimates of the effects of the interventions compared in all the relevant studies. The results for important outcomes are also summarised in tables that link the numerical results with the confidence that these estimates are likely to be true; generalizable; and not altered significantly by further research. Cochrane Reviews compare the effects of pharmacological, non-pharmacological, and public health interventions, as well as the manner in which health services are organized and delivered. Some assess the accuracy of tests used for screening and diagnoses of health conditions. Cochrane Reviews are powered by rigorous, constantly evolving methods that have pioneered and driven the field of research synthesis. Cochrane Reviews are also independent of funding from the pharmaceutical industry, and are judged to be more reliable than non-Cochrane systematic reviews. The Database of Abstracts of Reviews of Effects (DARE) contains abstracts of systematic reviews published in other journals; many provide a quality-appraised, structured summary prepared by the Center for Reviews and Dissemination at York in the UK. The Cochrane Library is thus a one-stop portal to the full records or abstracts of most of the systematic reviews published in the world. The Cochrane Library also contains The Cochrane Central Register of Controlled Trials (CENTRAL), the world’s largest database of published and un-published randomized controlled trials. This register is compiled through contributions from Collaborative Review Groups; the Cochrane Centers and their branches worldwide; and others within the international Collaboration. Other databases provide records of economic evaluations, health technology assessments, and of studies evaluating research methods. No other single resource can match The Cochrane Library for the scope and quality of data provided to guide health decisions. The Cochrane Collaboration represents the health-research and health-services equivalent of The Human Genome Project, according to an article in The Lancet. The Cochrane Collaboration is a Non-Governmental Organization in Official Relations with the World Health Organization (WHO) and has a seat on the World Health Assembly. This provides the Collaboration an opportunity to influence the way research evidence is generated and used by the WHO in developing policies and guidelines for use worldwide. The Cochrane Collaboration enters the 21st year of its existence as the world’s leading provider of independent, trusted, high-quality systematic reviews, and derivative products, to inform health decisions. The evidence in The Cochrane Library is about the health conditions that affect all people; and embodies the efforts of many millions of people with diverse health conditions who consent to participate in research that may, or may not, directly benefit them. It also reflects the efforts and skills of researchers who conduct the primary studies and of those who synthesize the results. To ensure that this collaboratively-generated body of evidence is actually made available to everyone is a priority for The Cochrane Collaboration. The abstracts of all Cochrane Reviews are free to everyone in the world to read, but access to the full text of these high-quality reviews and to the other content in The Cochrane Library requires a subscription. The Collaboration and its publishing partner, Wiley-Blackwell, have promoted various funded initiatives since 2007 to ensure that people in 109 countries in some of the most impoverished parts of the world have free one-click access to reliable evidence regarding their healthcare needs. Ensuring that reliable evidence is accessible to all people, particularly to those living in low-income countries with a disproportionate burden of disease and who are most in need of this evidence, yet who have competing priorities for their limited resources, is a major challenge. This is because some countries, who fall in the category of upper, low-income countries, in the World Bank listings, like India did in 2007, do not qualify for free access. This challenge of ensuring wider global access has been complemented by the increasing numbers of provisions funded by governments or other agencies in middle- and high-income countries that now ensure that more than half the world’s population have free access to Cochrane evidence. For example, in 2012, new national provisions were funded by governments in Oman and Egypt; and the National Health and Medical Research Council of Australia funded the renewed licence for Australia-wide access to The Cochrane Library for the next five years. These examples signify the importance placed by governments, of ever increasing numbers of countries, in Cochrane evidence; and for wide-spread access to this evidence. Negotiations continue, I am given to understand, between the ICMR and Wiley-India on renewal of the national subscription for India. Meanwhile, I invite your comments on what you consider was the impact of spending hard-earned, tax-payers’ money to provide free access in India to The Cochrane Library. I shall enumerate herein, different ways that I consider that this impact can be measured. I request your additional contributions, as well as alternative, even if contradictory, views by which this re-investment in reliable evidence should be evaluated. These comments may help the ICMR to fully appreciate the impact that their initiative has had on the health of people in India, and in other parts of the world; and also reveal the views of people who use this evidence, so that decisions regarding the renewal of the national subscription may be better informed. Compiling and comparing incremental statistics of the number of page views of each of the online databases of The Cochrane Library, and the number of full text-downloads of Cochrane Reviews from the CDSR, provides valuable data on the interest people in India have shown in accessing these resources. The problem with this traditional approach to evaluating the impact of the national subscription is that reliable statistics are only available for those accessing The Cochrane Library directly from the online Wiley-interface (www.thecochranelibrary.com) and not from other sources by which readers can access The Cochrane Library such as PubMed, PubMed Health, the OVID platform, the EBSCO platform, summaries viewed in www.cochrane.org, those accessing Cochrane Reviews on handheld/mobile devices, etc. These statistics do not also include access to individual reviews from institutional or other repositories that authors may have deposited their reviews in; or from the DVD version of The Cochrane Library that the contact authors of new and updated reviews are provided. It is therefore an under-estimate of the usage and impact of Cochrane evidence. Figure 1 (provided by Wiley-India) records the dramatic increase in the number of full text articles downloaded from The Cochrane Library by users in India over the six years of the national provision. The growth in full text downloads mostly relate to full texts of Cochrane Reviews (~85%) and reflects an absolute increase of 162,401 reviews downloaded by people from all regions in India in 2012 compared to the 9,338 reviews downloaded from 11 institutions in India with an institutional subscription in 2006. This represents an 18-fold increase in downloads of the full-text of Cochrane Reviews, over a wider geographical spread in India, through the six years of the national provision. Before the national subscription was purchased in 2007, downloads of full-text articles averaged around 500 per month (in 2006). By 2009, at the end of the first contract for national provision, this had increased to an average of 4500 per month. In 2012, the last year of the second national license, on average 14,311 full text articles per month were downloaded from The Cochrane Library in India. 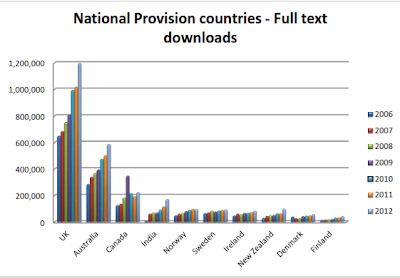 This represents a 29-fold increase in downloads per month over the six years of the two periods of national provision, compared to 2006. The Cochrane Library is accessed by numerous users from all walks of life in India. 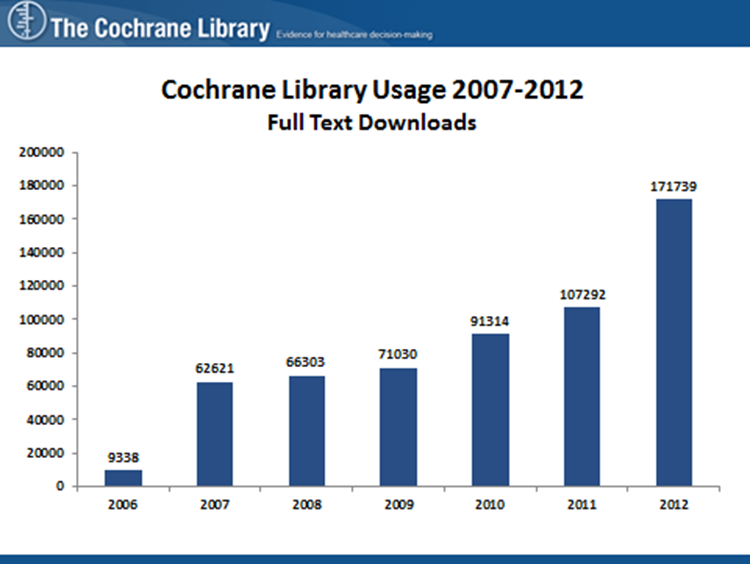 Wiley-Blackwell, the publishers, estimated that in 2009 someone in India downloaded an article from The Cochrane Library every 12 minutes; this is likely to have been considerably more frequent in 2012. The increase in usage was appreciably greater during the period of the second national provision (2010 to 2012) compared to the first three years of national access. This could partly be due to the publicity that accompanied the 2nd South Asian Regional Symposium on Evidence- Informed Health Care and Health Policy hosted by the South Asian Cochrane Network and Centre (SASIANCC) at the Christian Medical College, Vellore in January 2010 that saw over 650 participants and witnessed 44 plenary talks (including one by the Department of Health Research and the ICMR) and 22 skills-building workshops. Other dissemination workshops organized by Wiley-India, and also by Network Sites of the SASIANCC and the Centre in various parts of the country through 2011 and 2012, undoubtedly contributed to increased usage of The Cochrane Library during the last two years. This suggests that usage over the next few years is likely to grow rapidly, especially with the publicity and participation envisaged by the 22nd Annual Cochrane Colloquium that will be hosted by the SASIANCC at the Hyderabad International Convention Centre from 21-25 September 2014. India ranked fourth worldwide in 2012, after the UK, Australia, and Canada (all countries with a longer history of engagement with Cochrane), for the number of full text articles downloaded from countries with a national provision. India ranked fifth when downloads were compared overall for all countries; with the US that has a mixture of academic subscriptions and funded provisions in some states and provinces leading the list of countries accessing Cochrane content worldwide (Figure 2: courtesy Wiley-Blackwell). India does not figure so prominently in any other worldwide ranking of indicators of good health, healthcare, or healthcare governance. These statistics do not completely capture the usage of the resources in The Cochrane Library in India: during 2009, 47,024 additional visits were made in India to The Cochrane Library and 84,441 abstracts were viewed. During 2012 there were 55,096 additional visits from readers in 20 Indian states and union territories to The Cochrane Library homepage. Surveys using Google-analytics as a proxy indicator of interest in Cochrane in India, and to reflect healthcare information-seeking behaviour of healthcare professionals, researchers, students, and consumers, were presented during the regional symposium at Vellore in 2010. They revealed that “Cochrane‟ consistently scored more frequently than the four top-ranked Indian health portals (MedInd, Health Library, Doctor NDTV and Web Health Center, over the period 2004 to 2009; with a dramatic increase following the national provision, and periods of increased activity reflecting national Cochrane-related workshops or symposia. “Cochrane‟ also scored above Indian journals (Indian Journal of Medical Research, National Medical Journal of India, Journal of the Association of Physicians of India, the Postgraduate Medical Journal and others) and international journals (NEJM, The Lancet, BMJ and JAMA) for the most commonly-searched term in Google during these years. 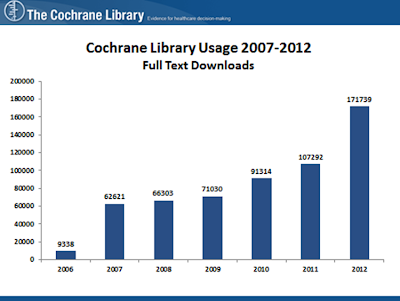 These surveys mirror data from Wiley-Blackwell on usage of The Cochrane Library from 2007-2009. However under-estimated these statistics are of actual usage, they nevertheless do tell us that people in India are increasingly using The Cochrane Library to access and download Cochrane Reviews. Indian users of The Cochrane Library are reading Cochrane Reviews on a range of topics relevant to their needs. 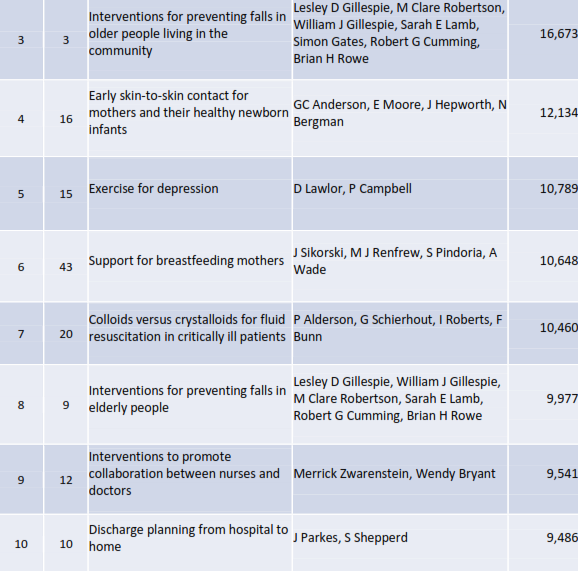 Table 1 (provided by Wiley-India) below, shows the 10 most downloaded Cochrane Reviews in India in 2012. Green S, Buchbinder R, Hetrick SE. Pollock A, Baer G, Pomeroy VM, Langhorne P.
Galappaththy GNL, Omari AAA, Tharyan P.
Waters E, de Silva-Sanigorski A, Hall BJ, Brown T, Campbell KJ, Gao Y, Armstrong R, Prosser L, Summerbell CD. Li Y, Tang X, Zhang J, Wu T.
Bleakley C, McDonough S, Gardner E, Baxter GD, Hopkins JT, Davison GW. Teixeira LJ, Valbuza JS, Prado GF. Rutjes AWS, Nüesch E, Sterchi R, Jüni P.
This table also demonstrates the range of clinical topics provided by Cochrane Reviews that Indian readers consider relevant; they differ considerably from the top 10 reviews accessed worldwide (Table 2- courtesy: Wiley-Blackwell). International newspapers and other media channels regularly carry stories based on Cochrane Reviews. Indian media are consistently among the top five countries that carry news about Cochrane Reviews. This ensures that readers from a wide-spectrum of the public are regularly informed about the evidence (or lack of evidence) for benefits and harms regarding health interventions that they might be prescribed. Many of these news stories are archived in web pages of The Cochrane Collaboration, and reflect the in-depth understanding of these reviews that go into the preparation of these reports. The media has also seen debates around the relevance of evidence-based medicine in India that have provided opportunities to educate the public on the nuances of evidence-informed health care. India is considered by many, including its politicians and many of its business leaders, as an emerging economy with an impressive record of domestic growth, and with an increase in its demands for inclusion and influence in global politics and commerce. Moving out of the World Bank listing of low-income countries to the status of a middle-income country requires a change in mind-set: from being a passive recipient of foreign aid, to assuming greater responsibility for ensuring equity and quality in healthcare for its people. Contributing to building the evidence-base to inform health decisions that affect its people is an important part of this greater responsibility; contributing evidence to inform the health of people in other parts of the world is an extension of this responsibility. The national provision to The Cochrane Library provided clinicians and researchers in India free access to the best that research synthesis could offer, and stimulated interest in them to contribute to this global collection of reliable evidence. In February 2013 the Information Management System (IMS) of the Collaboration listed 75 Cochrane reviews and 73 published protocols of reviews with a contact author living in Bangladesh, India, Pakistan, Nepal and Sri Lanka (countries represented by the SASIANCC). The contact authors of 59 full reviews and 48 protocols of reviews in progress were from India. In contrast, in 2006 there were 11 reviews and protocols with a contact author from India. However, the numbers of authors who are involved in producing Cochrane reviews as co-authors (and not the contact author) are far greater. In February 2013 there were 186 protocols and 185 Cochrane Reviews listed in the IMS that had an author from one of the countries represented by the SASIANCC; authors of 110 Cochrane reviews and protocols were living in India. This system also listed 435 people from India as registered active authors in February 2013; this represents a 36-fold increase in the number of authors compared to the 12 authors from India in 2006. There are also 10 editors of Cochrane Review Groups in India. India now hosts the South Asian Cochrane Center one of the 13 independent Cochrane Centers around the world that advocates regionally for evidence-informed health decision making. None of these would have been possible if India did not have universal free access to the reliable evidence from Cochrane Reviews. Cochrane Reviews with Indian authors are contributing to global evidence for better health. The Cochrane Review “Zinc for the Common Cold” authored by Prof Meenu Singh and Rashmi Das from the Post Graduate Institute (PGI), Chandigarh received 6886 full-text downloads globally in 2011, and was also the most widely disseminated news report of a Cochrane Review in the world, “getting over 800 mentions across various media in the first two days after publication, and about 1000 mentions by day 10 in newspapers, television and radio (including in about 21 non-English languages)”. The Cochrane Review “Corticosteroids for acute bacterial meningitis” that lists Prof Kameswar Prasad from the All India Institute of Medical Sciences (AIIMS), New Delhi, as an author, has been cited 184 times. One of the top 10 most-accessed reviews globally in 2008 (Ayurvedic medicine for schizophrenia) was authored by Indian contributors, further evidence of The Cochrane Library’s role in extending the global reach and international profile of medical research from India. Cochrane Reviews, with and without Indian authors, have influenced decisions in Indian medical institutions; and have contributed to Indian and International health policies and health decisions. An example of a local decision where Cochrane evidence helped was presented by Dr Kadhiravan Tamilarasan, a Cochrane author who is on the faculty of the nationally-funded Jawaharlal Institute for Postgraduate Medical Education and Research (JIPMER) at Pondicherry, and was a member of a institutional committee formed to rationalise the use of free prescriptions for intravenous immunoglobulin that were being used for a variety of conditions. Evidence from 35 Cochrane Reviews on the effects of intravenous immunoglobulin for various indications, and of alternatives, was used to generate a list of conditions where immunoglobulin therapy was reported to be effective and safe, and to drive a policy that provides free immunoglobulin treatment only for these indications. One of the most down-loaded Cochrane Reviews in India in 2012 evaluated primaquine dosing for malaria due to Plasmodium vivax, with authors from Sri Lanka, UK and India, and was published in January 2007. The results were actively disseminated with the help of the ICMR, and were incorporated in the updated Indian Malaria guidelines in May 2007. The results of this review were also incorporated in subsequent editions of Park & Park’s textbook of community medicine that is widely used in medical schools in India. An updated version of this review will inform forthcoming revisions of the WHO Malaria treatment guidelines. A Cochrane Review with authors from South Africa, India and the UK, informed the Government of India’s decision to not provide nutritional supplements for people with tuberculosis (TB) in India, based on limited evidence of benefits. Updates of this review will also inform forthcoming revisions of the WHO guidelines on treating TB. An updated Cochrane Review of deworming drugs in children that included primary studies from India demonstrated a lack of many of the postulated benefits; however, deworming programmes are still in vogue in many states in India. Access to the full content of this review was important in order to inform policy makers about considering changes to Indian policies regarding targeted deworming of children. Access also helped us in preparing and disseminating shorter evidence summaries of the rationale, methods, results and public-health implications of this review, accompanied by a commentary by a clinical expert. Another Cochrane Review showed a lack of benefit on mortality and morbidity from routine health checks of healthy adults; yet such “master health checks” are very common, and are a source of considerable income to hospitals in the private sector in India; they are also funded by employers and by health insurance. Here too, access to the full text can inform policy revisions; and was used to prepare evidence summaries with a clinical commentary for dissemination. These are but selected examples of Cochrane evidence informing policy decisions; and many other examples, no-doubt, exist that you may be aware of. Forthcoming Cochrane Reviews with author teams from India will provide high-quality evidence on a variety of health questions of regional and global importance, such as alternatives to isoniazid in treating HIV-negative people with latent-TB infection; the role of intermittent treatments in treating childhood TB; interventions to prevent reactions due to anti-snake venom; and the role of Ayurveda in the management of rheumatoid arthritis. These and other such reviews of relevance to healthcare in India and other low- and middle-income countries are mentored by the Effective Health Care Research Consortium that is funded by UKaid (Department For International Development) to improve health outcomes in low- and middle-income countries. The ICMR funded for five years an ICMR Center for Advanced Research and Training in Evidence-Informed Healthcare at CMC Vellore, and is currently funding a Center for Advanced Research in Evidence-Based Child Health at PGI Chandigarh. The main activities of these centers are to build capacity in India to undertake relevant systematic reviews. The Cochrane Collaboration has also invested some of the royalties from the global sales of The Cochrane Library in funding four global projects that aim to increase the capacity in authors in low and middle-income countries to produce Cochrane Reviews that will impact on health outcomes locally and globally. The South Asian Cochrane Centre is partnering the Centre for Innovations in Public Systems (CIPS) that functions out of the Administrative Staff College at Hyderabad, to ensure that health policy-makers in the Ministries of Health and Family Welfare at the national and state levels are familiar with the resources in The Cochrane Library and the role of Cochrane evidence in informing national and state health spending. Full access to Cochrane content is crucial for these initiatives to have any of the intended benefits for people in India. Cochrane Reviews also provide an opportunity to identify those interventions and conditions for which insufficient evidence exists to adequately inform health decisions; these interventions could be prioritized for funding and for undertaking primary research. Examples of such evidence gaps that have spawned primary studies in India include two pragmatic trials evaluating the role of interventions used in the management of psychosis induced aggression. Insufficient evidence from a search of The Cochrane Library and other sources regarding the optimal dose of anti-snake venom to deal with snake envenomation, that claims the life of more than 50,000 people in India, led to the development of protocols for observational studies. These studies will see a unique partnership of herpetologists, clinicians, venom detection experts and anti-venom manufacturers collaborating to ensure better health outcomes for the many thousands of Indians in rural areas who are bitten, often fatally, every year by venomous snakes. The rigorous methods used in Cochrane Reviews ensures that those undertaking these reviews, as well as those using these reviews, learn about good research methods, such as assessing the risk of bias in primary studies; the importance of using appropriate outcomes and estimates of effects such as risk ratios with their confidence limits; and about assessing the overall quality of the evidence using the GRADE approach. These methods also stress the importance of incorporating the elements of transparent and reliable reporting of research that are specific for the type of research question, in study protocols. The Cochrane Handbook for Systematic Reviews of Interventions and of Diagnostic Test Accuracy, provided free for anyone to download and use, are excellent resources to understand the challenges and approaches to research synthesis. The propriety software used to prepare Cochrane Reviews and for meta-analysis (Review Manager), and to prepare summary tables of the important findings of systematic reviews (GRADE Profiler), are also free to download and use by anyone. Many non-Cochrane reviews by researcher in India (and elsewhere) regularly search The Cochrane Library and its Central Register of Controlled Clinical Trials. Many also use the methods used in Cochrane Reviews and prepare their reviews using Cochrane software; thus improving the quality of their reviews. The impact that The Cochrane Collaboration has had in India is exemplified by the ICMR’s recent call for proposals for researchers in India to undertake systematic reviews. The ICMR has invested in six funded-systematic reviews dealing with topics in maternal and child health, following a call for proposals, with members of the SASIANCC helping with the selection process. These reviews will be conducted by teams trained in Cochrane methods and will use Cochrane software to prepare these reviews. Without free access to The Cochrane Library, these contributions to global evidence from India will decline considerably. 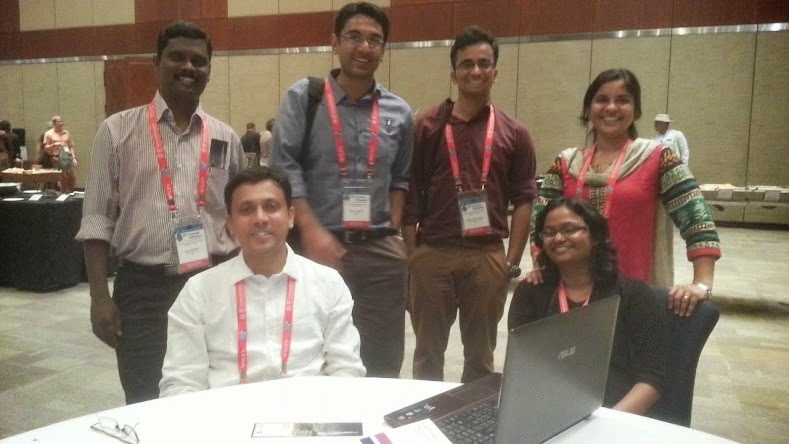 The Cochrane Student’s Journal Club is a student-led online journal club, launched by students in India and endorsed by The Cochrane Collaboration. It uses clinical scenarios to help students frame answerable research questions, and guides them in finding and interpreting evidence from a relevant Cochrane Review in order to help students understand the steps of evidence-based medicine (EBM). Many leading institutions have training programmes for undergraduate and post-graduate students to ensure that tomorrow’s doctors will be better equipped to ensure the practice of EBM in India. The International Society for Evidence-Based Health Care (ISEHC) held their inaugural conference at Delhi recently with the mission of developing, and encouraging research in, the appropriate usage of evidence in health care decision making and to promote and provide professional and public education in the field. The Indian Chapter of the ISEHC was also established to ensure better practice of EBM in India. These initiatives will complement that work of The Cochrane Collaboration in India and elsewhere. None of these initiatives will succeed without the cornerstone of evidence-informed health care- reliable evidence from Cochrane Reviews. The special introductory price that was brokered by the SASIANCC, and facilitated by well-wishers in The Cochrane Collaboration, and the World Health Organization, with John Wiley, the publishers in 2007, and the ICMR, was considerably lower than the astronomical initial asking price that was based on the formula used for other national provisions, where every head of the population is charged 10 to 15 US$ for national access. A realistic re-assessment of those among the over 1 billion Indians with sufficient literacy in English who also had regular access to the internet and were likely to access The Cochrane Library, reduced the pool of potential users of The Cochrane Library to around 60 to 100 million people. The introductory price was reflective of this reduced pool of potential users. The price for renewals follows the same principle, with marginal increases to account for inflation. Considering the number of full-text downloads in 2012 and the cost to India for the national license for 2012, the cost of each download works out to less than one US$. The cost of accessing an article in the Cochrane Database of Systematic Reviews currently is 35 US$. The many instances detailed herein indicate that renewing the national license will provide richer dividends than can be evaluated by the usage statistics; or the cost per download; or impact factors- of which the CDSR has one of the fastest growing among medical journals. The true impact lies in the lives saved through the use of effective treatments and the withholding of ineffective or harmful treatments. True leadership facilitates the realisation of the vision of others that are aligned to achieve mutual objectives. The SASIANCC salutes the ICMR and the Department of Health Research for exemplary leadership in research governance that facilitated considerable progress towards achieving the vision of The Cochrane Collaboration: that all health decisions (in India, the region, and the world) will be informed by reliable evidence. So much more remains to be done and world continues to need visionary leadership to achieve better health outcomes for all people. For value of money, I believe that the ICMR and the Department of Health Research can do very little to better the impact on health that renewal of the national license can achieve in India. Declaration of Interest: I am the Director of The South Asian Cochrane Network & Centre (SASIANCC). Without free national access to The Cochrane Library, the SASIANCC will find its work largely irrelevant to the people of India. We are committed to finding ways to ensure nation-wide access in India continues.